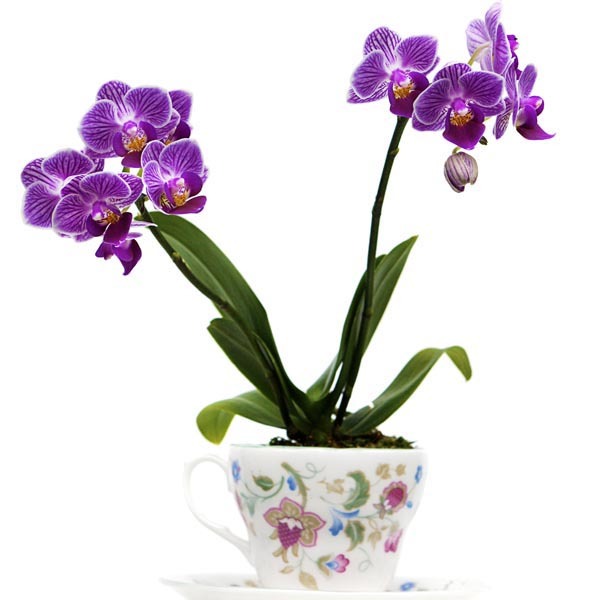 These charming orchid varieties are the perfect size for a table, shelf, or counter. Very easy to care for and flowering can last for weeks. When the blooming period ends the foliage still makes an attractive houseplant. Mini orchids make wonderful gift plants because they are simple to maintain even by those with very little experience caring for houseplants. Makes a breathtaking potted specimen plant. Very decorative on a small table or windowsill. May be displayed outdoors in warmer weather. Makes a lovely gift! Water freely during active growth. Keep away from drafts. Water freely during active growth. Repot every two years in the same container or in a container slightly larger than the diameter of the roots. If the plant was purchased in a pot, then it is probably already in a quality bark mix and requires little more than watering and grooming for a while. When potting an orchid, start with a good quality, commercial orchid bark mix. This is usually found in the same area of the store as potting soil. Select a simple clay pot with a hole in the bottom or a specialty orchid pot with holes on the wall of the container. Prepare the container by mounding bark mix so that it’s level with the rim of the pot. Gently hold the leaves and drape the roots evenly over the mounded bark. Add a little more bark at a time; tightly packing each addition into the pot, under and around the roots. Once the orchid is potted, water thoroughly to soak the new bark and give the plant a good start. Most potted orchids prefer the bark mix to dry between thorough watering. If the mix gets too dry the blooms can wilt and they may not recover. Check the bark mix moisture with your finger. If the top inch (3 cm) of bark is dry, it’s time to water. To water your orchid, set the base of the pot in a shallow tray of water for 5 minutes and allow the orchid bark mix to soak up water until the pieces are damp at the surface level. This indicates the bark mix is thoroughly wet. Drain the excess water and set the orchid pot back in its saucer. Fertilizers are available in many forms: granulated, slow-release, liquid feeds, organic or synthetic. Liquid houseplant fertilizer is the best application method for orchids. Select a product with a nutritional balance of 20-20-20 and dilute it to a quarter the recommended strength. Remove the flowers as they fade. This keeps the plant looking tidy and may encourage more blooms depending on the type of plant. When the stem is done flowering, snip it off at the base just above the main plant. After flowering, orchids make attractive houseplants.